B U B B L E G A R M: Good Times.. I unexpectedly found these items today.... As you do. I am in LOVE with this jump suit, the colours are very Autumnal and I deemed it perfect for myself, it was a bargain at £30 from Zara. It doesn't look like much on the hanger so I tried it on for you. The waist has some gathering but I thought it needed breaking up so introduced a belt. I plan on wearing it to the cinema as we are going to go see Paranormal Activity 2 sometime this week. 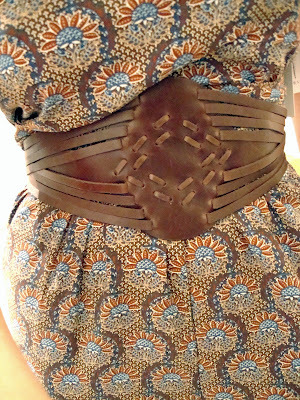 Gotta love intricate waist belts for some jazzing. I casually *whistles* bumped into these earrings in Topshop at the Orelia stand, and look how much the pale blue beads match the fabric of the jumpsuit. MINE! I thought it was very cool, easy to wear and shaped like nothing I own. I also finally picked up Barry M's instant nail effects and a chunky glitter nail polish - Woot! 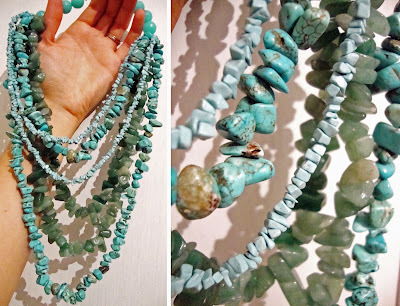 Also, yesterday I made this statement necklace with semi precious Turquoise and Jade stones, it will complete any basic outfit, particularly a black dress. How would you wear a jumpsuit? What do you think of over sized jumpers and statement necklaces? 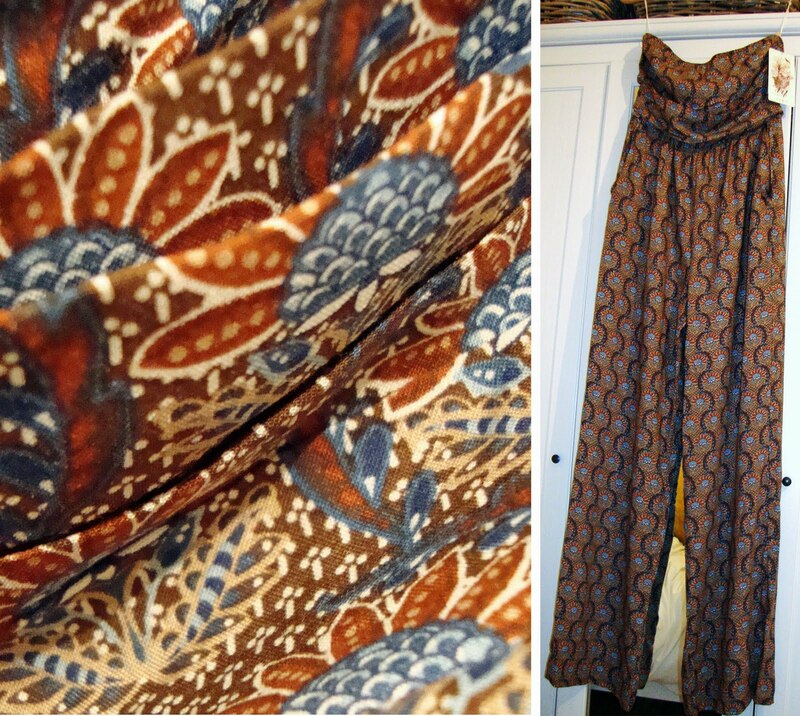 I would wear that jumpsuit with trendy shoes and big earrings and maybe some statement bracelets. the jumpsuit and the belt look PERFECT! @~All Things Girly~ Nooo, don't be silly! But thank you. wow love the jumpsuit, so stunning for autumn and the gold necklace, so unique! Not sure about the Nail Effects what do you think?? @Karen lol, yes the loo problem, well we will live :) also, theres nothing better when someone compliments you on your jewellery and you tell them you made it - priceless. what amazing buys! the jumpsuit looks FANTASTIC on you and i adore that h&m sweater. i've seen it on someone else and i immediately fell in love. i'll definitely need to be on the lookout for it! and the turquoise and jade necklace is beautiful, well done! The belt totally transforms the jumpsuit, great choice! oh and i looove the jumpsuit on you! that jumpsuit is to die for! and the necklaces are gorg! I am not a jumpsuit person.... in fact you couldn't pay me to put one on, but you look amazing! You look gorgeous! That jumpsuit looks amazing on you mA! I love the colors, and the belt! love the sweater from h&m, such a nice warm and cozy piece for the winter! I love that sweater! I might just have to go and pick one up myself :) I'm also loving the new banner. I've been working on making my own banner...any tips? Also, I noticed that you've removed the link to lolicoco, is that on hold for now? I actually purchased two jumpsuits this summer (US). I love them both. I am going to look for fashion belts similar to the one you have--adds that extra touch. I love statement necklaces. I just purchased a few last week. I plan to wear my large one with flowers to my brother-in-law's wedding. Thanks SO much for your kind comments girls :) I can't wait to wear my jumpsuit, probably going to wear it tomorrow evening! you look AMAZING in that jumpsuit! I love the look of jumpsuits but they seem like something that would be hard to wear, or that you would need to try on a lot of to find the right one. But when they fit well (like yours), I love how they look! I really really love that necklace as well, I'm always on the lookout for simple yet unique pieces like that, you can wear it with anything! I was wondering if you wear Turkish? Love the jumpsuit on you and I'm a big fan of them myself! I just got one in leopard (sounds crazy, I know). Can't wait to wear it!